Home / Blog / Why Go Abroad? Ciao! I’m Sarah Hadley, and I go to the University of Alabama, but I’m currently studying abroad in Florence, Italy at Florence University of the Arts. 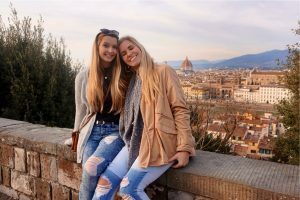 While I can’t wait to share my experiences in Florence so far, I feel like it’s so important to share why I chose to study abroad. For the past five months, I have had the somewhat monotonous (yet completely understandable) task of explaining that I’m studying abroad, including where, why, and how, to literally everyone. Now, I didn’t just go around telling everyone about it, but discussing the upcoming semester really comes up in conversation a lot more than I ever realized. “Are you excited to go back to school?” “What are you taking next semester?” “Why aren’t you in Tuscaloosa?” etc. When faced with these questions, I never had the chance to fully explain why this semester is so important to me. People ask how I could spend a semester away from my best friends, my family, and my school. They ask how I could handle the FOMO. They ask how I could possibly go not knowing a single person in the city. They ask why I would go for a whole semester rather than just a summer. I absolutely loved the hike with SAI to Piazzale Michelangelo. It is so beautiful, I even got over 19,000 steps that day! At first, I did worry about missing out on so much college with so many people I love. Of course, I was scared to miss my family, my dog, and my own bed. Now, this is the way I think about it: if I live to be 90 years old, I will have lived for a total of 1,080 months. I am living in Florence for 4 months. That is only 0.37% of my life!! It’s only 12.5% of my college experience (and that’s not counting summers or extra semesters which we all know are going to happen lol). The point is, you have to realize how minuscule this amount of time is in the greater picture of your life. Heck, I want to spend WAY more than 0.37% of my life traveling! I realized that there are no excuses to avoid this incredible opportunity. The view that never gets old! Seeing all of Florence from Piazzale Michelangelo is an absolute must in the first week abroad here. You really get to see how amazing your new home is. Personally, I have recently struggled with understanding who I am, the kind of person I want to be, and the things/ideals that I truly value in life. I felt so lost like I didn’t really know myself, but I realized that this isn’t a personal problem at all. This basically sums up the emotional roller-coaster of college. When considering studying abroad, I wondered if I was running away from my problems and worries. And maybe I am. I mean, there is no better place to run than Florence, Italy. In retrospect, the more I consider my thought-process at the time, I remember having little visions of myself in my head sitting alone in a café, sipping a cappuccino, writing a paper…feeling content just spending time with myself. I imagined myself taking the train to Rome with faceless friends who would know me only by my nervous, way-too-loud personality in my first few weeks abroad. I could decide to be the best version of myself, the person I would be most proud of, the second my plane left the ground in the US. Walking past the Basilica of Santa Croce on the way to class is definitely the best way to start the day. I had the absolute fairytale abroad experience planned out in my head. Basically, I was going to become a worldly traveling guru who is practically Italian and actually has her life together. And I was going to wear a silk scarf while doing it. I must say, I am not worldly yet. Mostly just confused. I am not practically Italian and I honestly can’t even order my food for myself without pointing and looking extremely apologetic. Also, it’s freezing, and a silk scarf is not practical. Despite these minor-ish misconceptions, I have already seen a change in myself in the past few weeks. I have made incredible relationships with my new roommates and new friends. I have even begun some relationships with very kind café owners who can really tell I’m trying my best. Most importantly, I have begun a new relationship with myself. I am learning that it is totally okay to make mistakes in high-stress environments. While I would typically beat myself up over any minor problem, I am learning to accept my faults with grace. I am trying to focus on my strengths rather than my weaknesses (you see a lot of both during your first days abroad). In doing so, I have already noticed an increase in my productivity, and I am so much more confident and at peace with myself. I 100% owe these feelings to the incredible city of Florence and every single one of my experiences-good and bad. Five months ago, I knew I wanted to see the world, and I knew I needed to know myself. The little feelings of excitement, the desire to truly know who I am, and the thoughts of what was to come did not leave me disappointed once I reached Florence. And it’s only the first week! 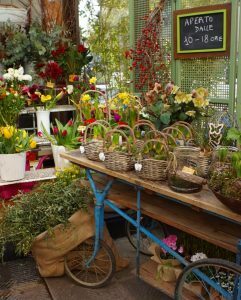 Beautiful flower stands like this one are scattered around Florence, especially near Sant’Ambrogio Market. I couldn’t help but stop and snap a photo of these beautiful colors. Although it sounds totally cliché, my study abroad experience has already changed my life. I am more confident and independent, yet I am also more aware and accepting of my shortcomings. Perhaps most importantly, I am learning about the world beyond myself. Lives, languages, and experiences so different from my own. 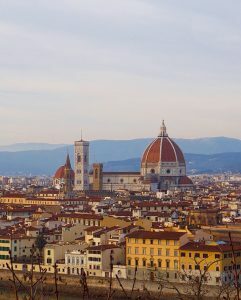 While I am only a guest in my abroad city for a few months, I can’t wait to leave a bit of myself in Florence and take all that I learn in Florence back home with me! Sarah is a spring 2019 SAI Florence student from The University of Alabama.